BUILDing Jewish ECE is a ground-breaking initiative that seeks to guide nine Denver and Boulder synagogues and Jewish community centers – and their early childhood education (ECE) centers – towards increasing enrollment, Jewish family engagement and connections to the Jewish community. BUILDing Jewish ECE is a result of eight years of research and work conducted by the Colorado Jewish Early Childhood Education Initiative Steering Committee, comprising four entities, including Rose Community Foundation. The committee supported a new Early Childhood Director at the Colorado Agency for Jewish Education, intensive professional development for teachers and directors, scholarships and financial support to ECE centers (including https://mazeltogether.org/), and a 2012 economic study that found that if Jewish ECE centers in the Denver/Boulder Area were operating at best practice standards, their congregations and JCCs’ revenues could increase $720,000 annually, an average of 11 percent. Among numerous recommendations, the study explained that synagogues and ECE centers need programs, campaigns and marketing that create inclusive relationships with members and aggressively communicate what synagogues or JCCs offer to families. Rose Community Foundation designed BUILDing Jewish ECE as a response to the study and reached out to the Jay & Rose Phillips Family Foundation of Colorado, Union of Reform Judaism (URJ), JCC Association and United Synagogue of Conservative Judaism (USCJ) to assist in this work as partners. This is the first time these national organizations have worked together. For the ECE centers, BUILDing Jewish ECE is a two-year process that provides ongoing coaching, training and guidance from the URJ, JCC Association, USCJ, and other experts, along with a toolbox of resources to expedite long-term growth. Participants attend seminars together with a group – or cohort – of colleagues and work with mentor coaches. All told, the resources and consulting to each institution are valued at over $90,000. Rachel Hagar, director of the Robert E. Loup Jewish Community Center (JCC) Early Childhood Center started with the first group of BUILDing Jewish ECE just as she started working as the center’s director. She says the marketing training she received was “amazing,” and as a new director, was “such a great tool” for working with prospective families. “It really helped us sell the school to parents in a way that was totally organic,” she says. Moreover, because of the way the program taught her to personalize her presentation to new families, she feels she already knows the child and the family well by the time their child enters the center. 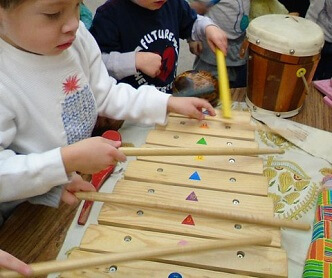 Children at Temple Emanuel’s early childhood center make music. Cantor Elizabeth Sacks, the senior director for education at Temple Emanuel in Denver, says her team participated in the first group with a goal of integrating their ECE center more fully into the life of the Temple. “BUILDing Jewish ECE gave us some space to talk about how that would happen,” she says. She goes on to say the program has helped them professionalize the marketing work of the center and think more strategically about how they present the center and their vision to families.